A.S.P. (Available Snap Points): The actual number of snap points (string crossings) used by the core geometry of the nuclear shell. If it is less then the R.S.P. (Required Snap Points) for the shell, additional Filler circlets and/or P.V.B. 's (Pinned Vector Bosons) will have to be added. P.V.B. (Pinned Vector Boson): A P.V.B. is any string which is pinned to or captured by a nuclear shell for the purpose of forming or emulating a Down quark, but does not lie on the surface of the nuclear shell. A P.V.B. typically contributes one snap point (string crossing) to the shell as well as the charge properties of the captured string. Radical Strings are one form of P.V.B., Orphan Strings are the other type. Tearing a P.V.B. away from the nuclear shell will cause a violation in the shell structure, essentially putting an Up quark where a Down quark should be. This may lead to spontaneous decay, or prompt restructuring of the nuclear shell into a new solution set. I believe this property can be equated with the weak nuclear force. Chemists will notice that the captive strings define some of the electron orbitals of nuclei. These orbitals are actually sharing a pinned string with the electrons (an Orphan string for the electrons, a Radical string for the nucleus). P.V.B. 's may therefore participate in covalent bonds. P.V.B's captured by a lower nuclear shell can sometimes be sandwiched between quarks in adjacent nuclear shells, resulting in a flattened lobe, providing a hybridized orbital (linearization) for metallic daisy-chain bonds requiring only a single interstitial electron nestled between nuclei. These P.V.B. 's are extremely important to physical chemistry, they can grow quite long, engaging nuclei and electrons throughout a material. They can pass thermal energy while blocking electrons, as is the case with the diamond lattice. When they contribute to crystalline structures I sometimes refer to them as lattice strings. They can also contribute significantly to the conductive properties of a material when they are pulled taught (by supercooling). Conduits clear of lattice strings will offer no resistance to the passage of electrons, and may even enhance it, as there are no lattice strings in the way to tangle with the electron's orphan string (a captured photon, shared between Cooper pairs.) The field of a permanent magnet is composed of lattice strings extending beyond the poles of the magnet. The accepted name for them is "field lines," or magnetic lines of force. The actual core geometry of a nucleus is composed of Hadron string, but virtually all bonding strings (of interest to chemists) are composed of Lepton string. That is a lot of different names for the same piece of string, but its a real important piece of string. Charge Jets, Charge Drains: Charge jets emanate from the surface of nuclear shells rather like conical spokes protruding from the surface with the apex coincident with the surface. An up quark produces a charge jet in lepton space and a charge drain in hadron space. A down quark produces a charge jet in lepton space off of its lower (positive) surface, and charge jet in hadron space off of its upper (negative) surface. Charge jets in lepton space push lepton strings (radical strings) into the familiar teardrop shaped lobes of "p" orbitals. The bogus down quark is a special case of a lepton string pinned to the charge jet off an up quark, wherein the pinned string provides negative charge transformations in the positive jet. The pinned string may actually be coupled in to the field structure of the up quark, permitting direct energy exchanges between the nucleus and the pinned string. Electrons have structure in lepton space, but should also display two charge jets in hadron space. (Every charge jet in hadron space has a corresponding charge drain in lepton space, and vice versa.) See "Charge Mirrors" below. Complementary Shells: A pair of nuclear shells, one proton shell and one neutron shell, in which the geometric distribution of up and down quarks on one shell exactly matches the geometric distribution of down and up quarks on the other shell. Every quark on one shell is paired with its complement on the other shell. Helium 4 (P2 + N2) is an example of a pair of complementary shells. Such shells will become "charge-locked" when they are stacked. Core Structure: Refers to the raw structural geometry of a nuclear shell minus any pinned strings and filler circlets. This usually only includes the structural loops, but may include equatorial circlets and/or sinusoidal strings if they form a base for multiple shell solutions with the addition of filler circlets. Down Quark: A collision cell formed by the intersection of four light strings having a negative charge current of 1/3. The Down quark may have both a positive and negative charge mirror associated with it, but the net effect is negative. I suspect the down quark somehow "floats" at the boundary between lepton space and hadron space, allowing each of its two charge mirrors to face a different domain. Consult Bogus Down Quark also. Equatorial String: Any nuclear string which bisects the nuclear shell. Filler Circlets: Small loops of string which are placed on the structural loops of the core structure to finish the quark intersections. Usually the L1 strings are structural loops, while L2's are Filler Circlets. Flower Petal Pinning, (Flower Pinned): Lepton strings can be pinned to multiple Up quarks on a nuclear shell, and a single such string pinned to three or more quarks either on the equator, or one of the poles of the nuclear shell, may form a multi-lobed structure resembling flower petals. Gluons, (Glueballs): In this theory "gluons" are simply the hadron strings closing into loops in the nucleus. "Glueballs" are isolated loops of hadron string which have been broken out of a nuclear shell, probably by a violent collision in an accelerator. I don't like these names and I don't use them. In this theory the intersections of the strings actually generate quarks. In nuclear theories that sport "gluons" and "glueballs," the quarks are considered separate entities "glued" together by these string-like "particles." Hopefully you can see the difference. I suppose physicists might want to interpret hadron strings as the manifestation of the chromoelectric field in quantum chromodynamics, in which case they might interpret the structures I have presented as maps of the nuclear chromoelectric fields, but I think it is a misnomer to suggest that quarks are "glued" together by these energy strings. Colliding string theory assumes that quarks are collision cells of these strings, and extends that reasoning to the domain of leptons as the products of colliding electromagnetic lines of force (lepton stings) producing similar particles in lepton space. In this model, an electron is assumed to be composed of three leptonic quarks. The reason leptons appear as point particles is because of an orthoganal rotation of dimensions between lepton space and hadron space. We are privlidged to see the structure of hadrons, but were we able to freely change our perspective and make our observations so that the structure of leptons were discernable, then I would expect hadrons to appear as point particles from that altered perspective. See Strong Nuclear Force. Gravitational Force (Quantum Gravity): Relates to specifics of the string theory, and I don't want to hint at the surprises yet in store, so... Out of the scope of this document. Hadron Space: The four dimensional manifold in which hadrons have structure. It consists of three spatial dimensions and a single time-like dimension which is shared with lepton space. See Lepton Space. Neutrino: Well, in this theory, they are lepton mirror symmetries of mesons, two-quark particles. Mesons are composed of hadron string and reside in hadron space, neutrinos would be composed of lepton string and reside in lepton space. Mesons are very short-lived particles which interact via the strong nuclear force(?!) Hmmm. I suspect a better definition is that they are composed of hadron string, and therefore may participate in interactions involving hadron string. By the same token, neutrinos, which are composed of lepton string should interact with leptons with the same agility that mesons interact with hadrons. (Beats me why they don't, maybe they just move too darned fast.) At this point I still find neutrinos to be somewhat mysterious in their nature, but then, I still have doubts about meson structure. Consider my interpretations of mesons and neutrinos as guesswork only. I'll leave it at that. Nuclear Isomerism: Nuclei with identical numbers of neutrons and protons may have different intrinsic shell structures (alternate solution sets, shell stacking arrangements, and/or different vector-pointing solutions for otherwise identical nuclear shells) leading to different decay rates, nuclear moments, intrinsic spin, and/or molecular bonding configurations. Nuclear String: Any string on the surface of a nuclear shell having three or more snap points associated with it. The exception is orphan strings, which may be loosely included in the definition of nuclear strings due to their similar composition, but not radical strings. Phase Imprinting: An electron in a fixed orbital may acquire and store phase data from an absorbed photon. In the twin slit experiments of quantum physics, electrons in the film used to record the interference patterns may actually produce those patterns by successive phase imprinting. The arrival times and the pattern of hits on the film in these experiments produce no interference patterns if the phase data is subtracted out, so by Occam's Razor, it would appear as though the electrons record phase data from the photons over time, and the interference patterns occur as a result of the sum of the phases of each photon thus encountered by the electrons in the film. Polar Circlet: A loop of nuclear string at the pole of a particle. Polar Stars: A number of the simplest solution sets for nuclear shells are characterized by star-like string configurations at the poles. These are referred to as the Polar Star shells. Pre-Quarks: Certain high-energy interactions cause intersections of only two strings to generate an unstable pre-quark collision cell. These pre-quarks are not permitted on the surface of a stable nuclear shell. In high energy physics, when nuclear shells of the colliding particles interact, there may be many pre-quarks briefly formed in the collision. I imagine this would have some kind of impact on the collision data. QM Fire (QMF), QM Burning: A theoretical type of plasma fire which is Quantum Mechanical in nature. It would arise under bizarre circumstances, such as a non-unitary collapse of the wave function for Schrodinger's cat. In this case, leptons and hadrons erroneously select alternate QM histories, and when the world lines of those histories diverge, they unzip the bonds between the leptons and hadrons resulting in a burning mode I have dubbed QMF. Spontaneous Human Combustion (SHC) appears from several of the more bizarre historical accounts to fit the description of a phased-electron QM burn. (If witnessed, victim becomes semi-transparent and blue plasma flames erupt. Portions of the body in contact with metal or the ground swap phased-electrons with environmental electrons prior to commencement of the plasma fire and are spared disintigration. Blood conducts electrons, so if bare feet were firmly planted, the heart and arteries might be spared, albeit cooked from the outside. Once the fire is lit, so to speak, the same kind of environmental electrical currents would accelerate the QM fire. Thus, throwing water on the victim accelerates the disintigration. QMF would favor those who had very few available, compatible QM histories to choose from, such as the elderly, or the daredevil types, or frequent travelers. QMF could cause even ice cubes to burn in a total vacuum, it is not the chemical type of fire with which we are familiar.) There are four possible switching mode errors, two of which initiate QMF (lepton decoherence, hadron decoherence), one causes the object to vanish and perhaps burn very slowly in a nebulous decoherent state (mutual decoherence), and the last mode (complementary decoherence) may induce further QM errors such as quantum teleportation (i.e. quantum tunneling), temporal dislocation, or object swapping from another QM history. I once performed a VERY crude calculation based on the number of reported cases of SHC I deemed probable QMF events, the population of Earth over the time of recorded history, and arrived at an estimate of the likelyhood of a person spontaneously combusting on any given day, the result was about 1 chance in 5-trillion. With the population of Earth what it is, it should happen naturally about every ten to twenty years. Considering that it could be an exceptionally rare macroscopic QM event, it really should be investigated in detail by physicists and chemists in conjunction with forensic scientists when it does seem to be a genuine SHC case. There should be physical evidence of positive ionization of the body if electron decoherence is involved. Knowing the victims history and recent choices could be enlightening. Intense environmental electromagnetic disturbances might increase the risk. Radical Down Quark: See Bogus Down Quark. Sinusoidal String: A nuclear string which forms a loop having a sinusoidal character perpendicular to the plane of the loop. An annoying complication which is required in the structure of the proton and neutron to satisfy the empirical laws of the geometry, and so must be permitted elsewhere. It has been my experience thus far that all sinusoidal strings tend to bisect the nuclear shell, and this might be evidence for a more descriptive empirical law to govern their use. There are not enough sinusoidal solutions to make any definitive conclusions at this point. N4-42S is an oddball sinusoidal solution which bisects the shell, but does so in a way which does not place the sinusoidal strings' snap points on the equator. N6-42S is another. Even so, both sinusoidal strings still obey the general convention that they bisect the nuclear shell. Snap Points: Snap Points are basically string crossings on the nuclear shells. I selected the name "snap points" to reflect the fact that these points are where the strings "snap" together to form intersections. Programmers of graphics packages will more easily identify it with snap-to grids and such. (I envision a simple program which uses only the snap points and empirical laws to solve for nuclear shells.) Note that snap points are a convenience of mathematics. A pinned vector boson is said to contribute a snap point for reasons of mathematical convenience in determining exactly how many P.V.B. 's will be required. In the specific case of P.V.B. 's, the P.V.B. 's may not participate in the quark intersection in the same way a nuclear string would. String (Energy String, Light String, Lepton String, Hadron String): Represented by wires in the shell models. Strings participating in particle structures and magnetic fields are typically closed into a loop. Open string segments constitute line-of-sight electromagnetic radiations, such as light. There are other technical details of the strings which I have elected to omit from this work for various reasons; I hope the reader can forgive me my reluctance to reveal everything at once. Four string types have been deduced which are pertinent to particle structures: Hadron String, Anti-hadron String, Lepton String and Anti-lepton string. Strings and anti-strings vary in handedness, lepton and hadron strings vary in dimensional orientation. Strong Nuclear Force: The force which binds quarks in the nucleus. In this theory it is a geometric constraint imposed on the nucleus by the fact that the strings must intersect to produce quarks, and the permitted forms for the string geometry yield intersecting loop structures of specific dimensions. Once constructed, I believe it is the electrostatic and electromagnetic interactions between the quarks stacked in the shell structure and the adjacent electrons which hold the nucleus together. (I don't believe there is a "strong" nuclear force, merely interactions involving particle spreadsheets, hadron strings, and electrostatic and electromagnetic phenomena. The tensile strength of a hadron string may be a contributing factor, but it appears as though these strings can be scattered into discreet corpuscles without violating the particle spreadsheet, so this contibution to the binding force is somewhat questionable.) Scatter the loops and there are no more intersections, therefore there are no more quarks. Even if there is a strong nuclear force, it would be much weaker than early calculations indicated, as I believe they were based on the force required to overcome the electrostatic repulsion of discrete protons in the nucleus. These shell models for nuclear structure clearly show that the protons are not discrete entities, but rather dispersed constituents on the spherical surface of the proton shells. Most of the charge is associated with the quark surfaces, and these face outward as well as inward, resulting in some cancellation of the mechanical force applied by charge to either surface. The existence of neutron shells stacked with the proton shells is an important stabilizing influence, and greatly reduces local repulsion within the nucleus. Electron pairs may also find their way into the hollow and positively charged interior of the nucleus to further cancel the repulsions. Further consideration of the matter has led me to the conclusion that all non-valence (s-orbital) electrons are building electron shells in the nucleus interleaved with proton and neutron shells, resulting in an enormous cancellation of positive repulsions in the nucleus of heavier elements. There is a slightly more in-depth discussion associated with the P6-30PB shell. Structural Loops or Circlets: These are usually the largest loops of string in a nuclear shell, and form the basic geometry of a shell upon which filler circlets are mounted. The placement of filler circlets can change the quark distribution for a shell, yielding different solution sets for the core geometry of a shell. Up Quark: A collision cell formed by the intersection of three light strings having a positive charge current of 2/3. One string should be vectored in opposition to the others to achieve a collision anomally. 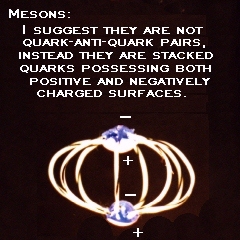 The Up quark should have two identical charge mirrors facing opposide directions.